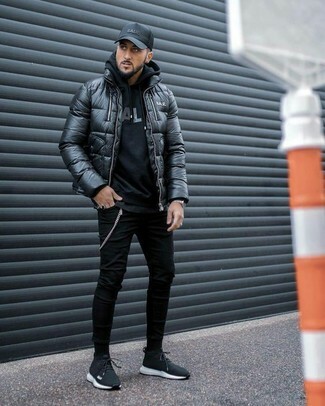 If you prefer relaxed dressing when it comes to your personal style, you'll love this easy pairing of a black quilted leather bomber jacket and black skinny jeans. 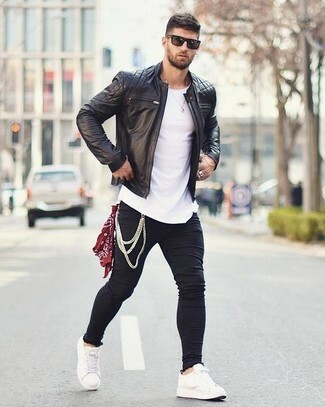 To add more class to your outfit, complete with white leather low top sneakers. 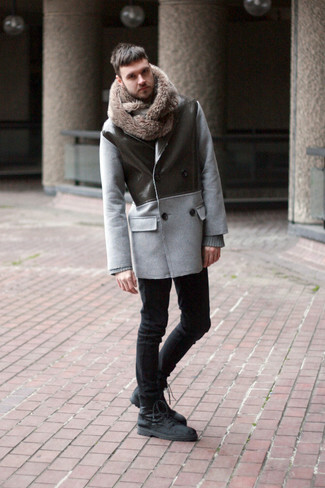 If you're scouting for a casual yet stylish look, rock a grey pea coat with Diesel sleenker skinny jeans. Both garments are totally comfortable and will look great together. Grab a pair of black suede casual boots to take things up a notch. If you're searching for a casual yet seriously stylish outfit, try pairing a beige trenchcoat with Diesel sleenker skinny jeans. Both pieces are totally comfortable and will look great together. Want to go easy on the shoe front? Grab a pair of black athletic shoes for the day. 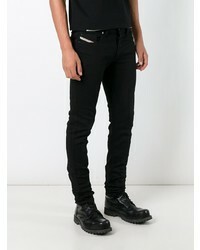 If you're looking for a casual yet sharp outfit, try pairing a black blazer with Diesel sleenker skinny jeans. Both pieces are totally comfortable and will look great together. Sporting a pair of brown suede chelsea boots is a simple way to add extra flair to your ensemble. 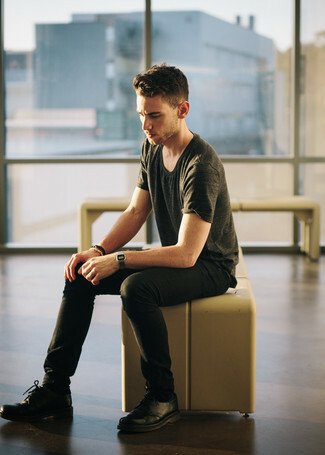 If you're all about practicality dressing when it comes to fashion, you'll love this killer pairing of an olive crew-neck t-shirt and black skinny jeans. Why not introduce black leather derby shoes to the equation for an added touch of style? 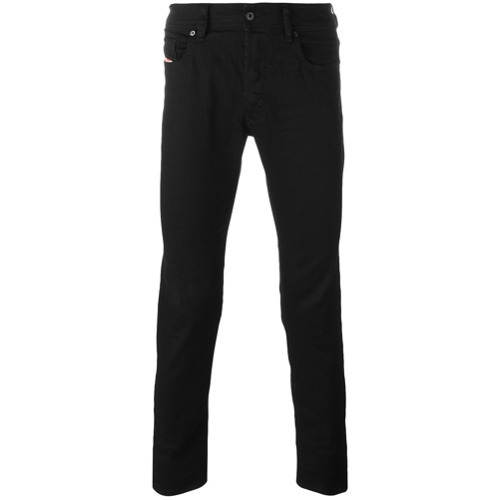 If you prefer a more casual approach to fashion, why not pair a black puffer jacket with Diesel sleenker skinny jeans from farfetch.com? 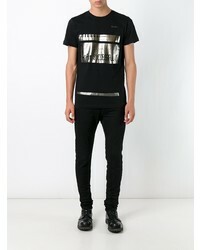 Black athletic shoes will contrast beautifully against the rest of the look. 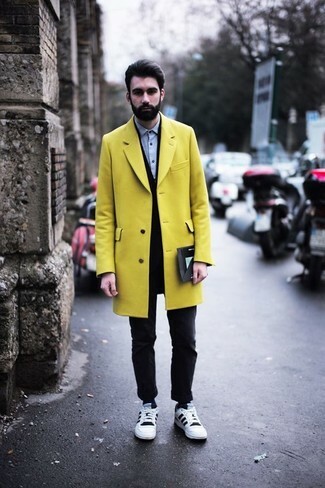 If you're searching for a casual yet seriously stylish outfit, pair a yellow overcoat with black skinny jeans. Both pieces are totally comfortable and will look great together. To bring out the fun side of you, finish off your getup with white and black low top sneakers. If you're all about practicality dressing when it comes to fashion, you'll love this stylish pairing of a black quilted leather bomber jacket and Diesel sleenker skinny jeans. To add more class to your outfit, complete with dark brown leather casual boots. If you're searching for a casual yet dapper look, consider pairing a charcoal wool blazer with Diesel sleenker skinny jeans. Both garments are totally comfortable and will look great paired together. 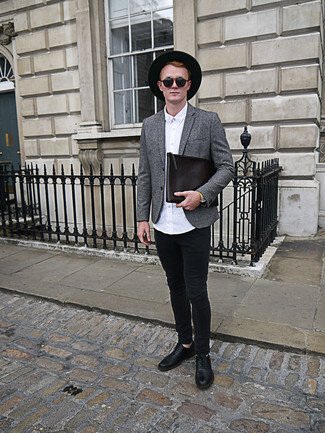 Wearing a pair of black leather oxford shoes is a simple way to add extra flair to your ensemble.